It's the second day of the Bloggers Christmas Beauty Brawl, woooo! Today it is eyeshadow palette day, meaning I am bringing you a Makeup Revolution Palette! I received this eyeshadow palette in a mystery gift bag ageees ago before Makeup Revolution moved over to TAM Beauty, when I spent £25. This is the Baked Eyeshadow in the shades Beyond Eden and it's only £2.50, how incredible is that for 5 eyeshadows?! Amazing. Firstly I like this product because of how small the packaging it. 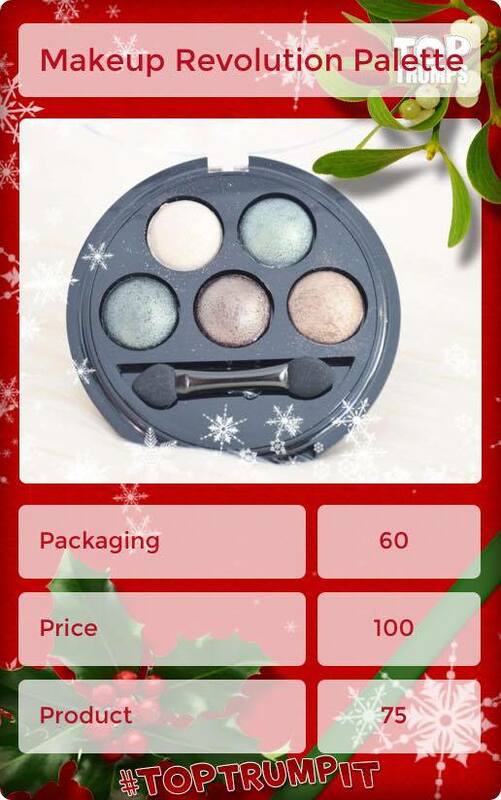 For a simple eyeshadow palette with only five shades the packaging is very petite meaning it's perfect for travelling with! As the eyeshadows aren't wide, they do not take up much room! However, they do protrude upwards which is what gives the impression of how much eyeshadow is actually there. Secondly, these eyeshadows are easy to blend. Sometims with the cheaper brands it can be very difficult to find an eyeshadow palette which has highly pigmented shades which blend easily and I'd say these have enough pigment, not too much, not too little and they blend well. I simply use a flat eyeshadow brush and pack the eyeshadow onto my eyelid. I use the bottom right eyeshadow to do this. I then use a fluffy brush to blend the middle shade into my crease (after using a matte brown). Lastly I go in with the shimmery white for my inner corner. Boom, bobs your uncle and you are done! These are so easy to blend. Overall, I'm really happy with the result of how my eye makeup looks after I have used this palette. As the eyeshadow's are easy to blend, the edges are a lot more softened than what I thought they would be. Especially for a palette which only costs £2.50. It's a bargain really. One Issue I have had with this eyeshadow palette is the fall out. Obviously for a cheap palette you will expect fall out but with the darker shades it can be rather annoying when you have to re-apply concealer (or foundation if you use it) after having to wipe away the eyeshadow which has fallen onto your cheeks. I really like this palette! Althouh I wouldn't say all of the shades are best suited for my eye colour, they would definitely suit someone who has brown eyes. The pigmented is incredible for the price, they are easy to apply and easy to blend and although I did have a little bit of fall out, it weren't too much either! I'd definitely say if they had re-thought the packaging, it would possibly be more attractive to the eye than the standard circular, black and transparent plastic. Overall, a product which I'd happily recommend to anyone on a budget. Make sure to head over to Elaine's blog to see what she posted for the second day of the Bloggers Christmas Beauty Brawl! I had one of these in different shades and I wasn't impressed unfortunately although the MUR New-Trals vs Neutrals Palette is stunning, im obsessed.